As homeowners, we often think of our dogs as protectors of our property. 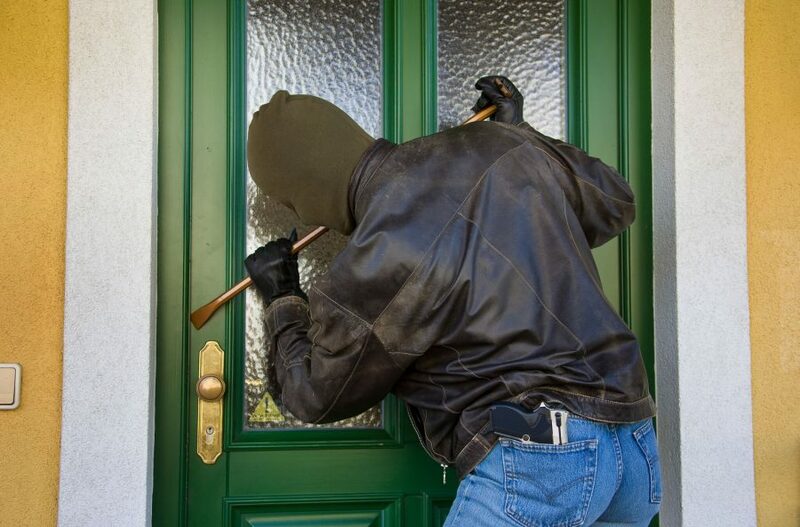 While the presence of a barking dog (especially a large dog) may steer daytime burglars away, home invaders are an entirely different breed of heinous criminals. When home invaders feel threatened, they typically resort to violence. And in many instances, it’s the family pet that is killed or injured and/or threatened as a means to control and get what they want from the homeowners. We all know that having an alarm system, security lighting, a security door brace, and a family security plan is critical in protecting your loved ones. Unfortunately, most homeowners don’t take the necessary precautions to shield their pets from intruders. The safety of a pet lies solely in the hands of its owner, and thinking ahead and putting a plan into action is the best way to shield your pet from violence. The following are a few protective measures you can implement to decrease your pet’s risk of becoming a victim during a home invasion. Post ‘Beware of Dog’ signs around your property. Displaying ‘Beware of Dog’ signs around your home can be an effective deterrent for home invaders and other criminals. Between the barking and the threat of being bitten, a home with a dog poses a greater risk to an intruder than a home without one. Signs that depict large, protective dog breeds can be very intimidating. Even if you don’t have a large dog, there is no harm in posting signs that make it appear you have one. When posting the signs, be sure to display them in prominent places around the exterior of your property. When turning in for the evening, consider securing your dog in a locked room or crate. When a dog is injured or killed during a home invasion, it’s often because of the dog’s aggression toward the intruder. A protective dog that is allowed to roam freely among the house is much more likely to make an intruder feel threatened versus one that is safely secured in a crate or a room of your home. Keep in mind that if anything about your dog is going to make an intruder think twice about entering your home, it’s going to be the sound of your dog’s bark. However, if the intruder decides to enter, the focus will be minimizing his risks during the crime, which often means finding a way to silence your pet. The less risk your dog presents to an intruder during a break-in, the higher the odds your dog will survive the crime unharmed. Prepare a protective plan of action that includes your pets. 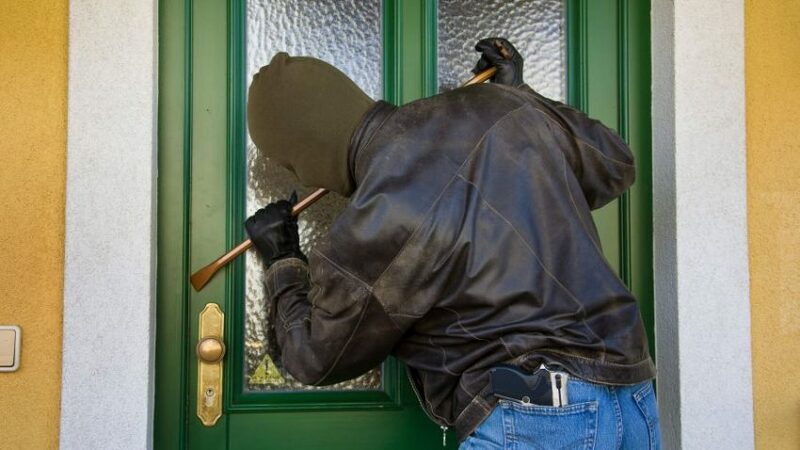 As today’s home invasion news reports go to show, criminals who invade homes while the residents are present are much more brazen and violent criminals. To protect yourself, your family, and your pets, it is important to plan ahead and think about the steps you can take in such a situation to minimize the risks. For example, if your plan includes having your family and pets retreat to a safe room or exit your home through a door or window, think of ways you can take your pets with you without placing yourself or other members of your family in danger. Once you’ve decided on your plan, take the time to rehearse it with your family periodically. The more you rehearse, the better everyone will know how to protect themselves and your pets. Invest in quality home security devices that are designed to prevent intruders from breaking into your home. In addition to running away or being injured or killed by an intruder, pets are also at risk of being stolen during a break-in. This is especially true of dogs. Certain dog breeds are more popular than others, as are purebreds that are not spayed or neutered. While some thugs look for Pit Bulls to add to their dog fighting rings, others look for expensive breeds, such as the Chinese Shar Pei (the wrinkly dogs), to sell. Regardless, the business of stealing dogs comes down to the same thing—money. To decrease the risk of having your dog or another valued pet stolen from your residence, ensure your home is adequately protected against break-ins. This means investing in home security devices that make it extremely difficult for intruders to enter your home through a locked door or window, such as the OnGARD security door brace and ShatterGARD glass protection film. Keep your dog indoors when you are away from home, and avoid leaving your dog unattended when outside. If you have a popular dog breed, have your dog spayed or neutered. This will decrease the chance of having it stolen for breeding purposes. Avoid leaving your dog home alone for long periods of time. If you have to leave your pet due to work, find a reliable doggy daycare service, family member, or close friend to take care of your dog while you’re away. Equip your family pets with an ID tag and microchip. Should an intruder ever enter your home and your dog or cat run out the door, it is important to have the means to locate your pet or for someone to locate you. The same is true should your pet ever be stolen. To increase the chance of your pet returning safely home, ensure your dog or cat is equipped with a collar and ID tag with your name and phone number imprinted on it. A beloved family pet should also be equipped with a microchip. Keep in mind that your pet’s microchip and ID tag are only as good as the address and phone number they provide. 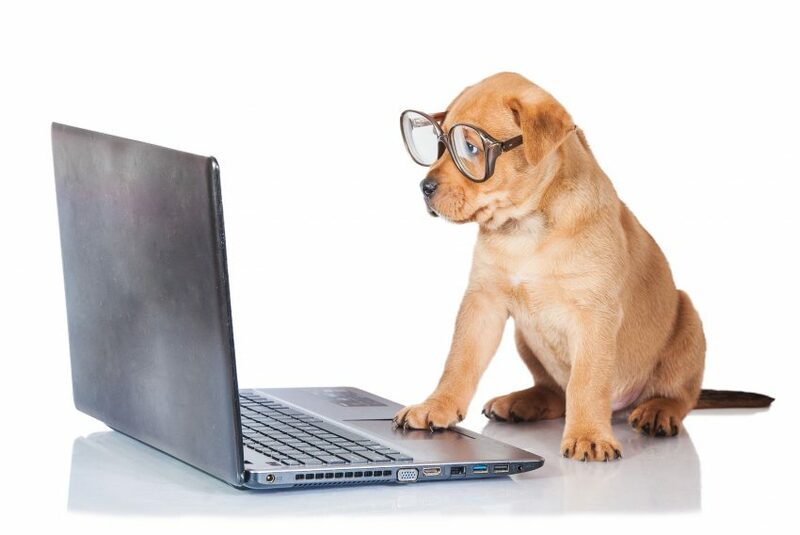 If you move or change your phone number, be sure to update your pet’s ID and microchip registration information. As a dog lover and owner, I understand just how much a pet can mean to a person. Our pets are so much more than furry companions. They are important members of our family, and they are just as vulnerable to falling victim to a home invasion as you are. To ensure the safety of your entire family, be sure to include your pets in your home security plan. Jordan Frankel, commonly known as The Security Sensei develops revolutionary security products and solutions that protect both lives & property. Countless agencies and corporations such as NASDAQ, the US Military, and law enforcement entrust Mr. Frankel with their security and safety. Jordan Frankel is also frequent media guest addressing the personal and financial consequences associated with home invasions, burglaries and other serious threats. In addition, Mr. Frankel’s security products & inventions have been featured on Oprah, FOX news and in countless publications. Jordan’s ability to outsmart the proverbial bad guys – coupled with his commitment to making security an affordable reality for everyone is the key to Global Security Experts Inc success. Mr. Frankel (The Security Sensei) is available for media interviews by appointment only.